02/27/13--15:23: Which Celebrity Tops Forbes Korea’s '2013 Power Celebrity' List? With a total of 32 TV advertisements in 2012, Girls’ Generation had the most advertising contracts of any candidate on the list. They’ve appeared in the top five of the list since 2008, and topped it the past two years. But these ads were not enough to secure their place for a third year in a row. For the first time in two years, Girls’ Generation took second place in the rankings. It's no surprise Youtube phenomena PSY took the top spot this year. Is your favorite celebrity on the list? March is a big month for celebrity birthdays, and we wanted to make sure you were up to date on all your favorite idols who are celebrating. This is also the month for astrological sign, Pisces, one of the more sensitive and artistic signs in the zodiac. With a gentle, comforting personality, someone with the Pisces sign probably loves to daydream and might even be a hopeless romantic. Top actors Jang Dong Gun, Jung Woo Sung, Kim Rae Won, and Kim Nam Gil are world-famous for their ability to portray emotion on screen, especially in crying scenes. Eugene and Jang Nara delight viewers with their lovable characters, and are known to be genuinely kind-hearted women off-screen. Check out the full list below to see if you share a birthday with any of the stars. Which of the celebrities fits the Pisces profile the most? Ballad singer Kim Jin Ho has been topping the Korean music charts since the release of his first solo album, "Today." You may recognize his smooth, soulful voice from his performances with famous singing group, SG Wannabe. Next week, Kim Jin Ho will arrive in the United States to perform at the Music Matters Asia showcase, but before his concert, we'll get the chance to meet him for an exclusive Google+ Hangout interview on March 6th- and YOU could be a part of it! You can watch our live the Hangout with Kim Jin Ho on our Viki Official YouTube channel at 6:00PM PST on Wednesday, March 6th. If you're a fan who would like to join the Hangout and meet this talented singer (you might even get your own lovely serenade!) just visit our Facebook page and submit a question that you would like to ask in the interview by 4:00PM PST on Monday, March 4th. If your question is selected, you will be invited to join the Hangout. You must include your Viki user ID in your question to be eligible. Our last Hangout with K-Pop boy group, Lunafly, was an amazing experience for the bandmates and the fans, who participated from countries like Colombia and Saudi Arabia. For his 23rd birthday, F.T. Island's Lee Hong Ki is preparing to get married. Don't worry, fans, it's only for reality TV. Hong Ki will be joining the international version of We Got Married, and will be paired with Japanese actress, Fujii Mina. We loved her performance as Akiko in The King of Dramas, and look forward to seeing the Japanese/Korean cultural exchange through the show. I know what some of you international K-Pop fans are thinking: Will they include non-Asian celebrities in future episodes? How about non-Asian non-celebrities? Where can I sign up? Maybe one day you'll get your chance. After all, Hong Ki definitely seems to be open-minded when it comes to romance. In the 2009 smash hit K-Drama, You're Beautiful, Lee Hong Ki played an idol who spent his youth overseas and may have been in a relationship with a European princess. He has stated on variety shows that age doesn't matter to him, and has even listed Australian model, Jessica Gomes as his ideal type. Which international star do you think would be a great match for F.T. Island's lead singer, Lee Hong Ki? It's easy to forget how fortunate we are. And it's important to remember that there are millions of people on this planet that don't have access to so many of the things that we sometimes take for granted every day, like water, food and shelter. It's great to see that some of our favorite stars recognize this, and are using their fame to help and bring awareness to those who are less fortunate. I was already falling for Yoon Shi Yoon's endearing character in "Flower Boy Next Door" but after hearing about his charitable personality, he climbed up my "love" list even more! Yoon Shi Yoon will be heading to Africa this month to work with starving children. Over the past 8 years, he has also hosted the event "Food Truck of Love" and has volunteered in other capacities often. Song Hye Gyo, star of the currently-airing drama “That Winter, The Wind Blows,” donated all her earnings from her work on a public interest campaign, to the establishment of a Chinese elementary school. The star said she wanted to return the love that Chinese fans have given her in the past! Yoo Ah In donated US$77,000 to a campaign to help children in shelters get proper nutrition. The actor also expressed his belief that, although anonymous donations are good, public donations are better because more people will be aware of it, and follow the lead. Look out for Yoo Ah In's drama "Jang Ok Jung, Live in Love," which will be live in April. Some of our favorite charitable American celebs are Angelina Jolie and Brad Pitt, who spend almost as much time supporting humanitarian efforts as they do filming blockbuster movies. Just a few other big-name celebrity philanthropists and activists include George Clooney, Sir Elton John, and Matt Damon. It's very heart-warming to see these celebs doing trying to do their part to make the world a better place for everyone. Is there something that a celebrity has done that has especially moved you? Share it with us in the comments! San Francisco has always been a hub for international talent and entertainment. Starting tonight, the city will welcome 11 amazing musical artists to perform in Music Matters Asia, part of CAAMFest. From hard rock to love ballads, this concert in the heart of downtown San Francisco will display the many talents of Asian artists. Viki will be live-tweeting from the event, so follow us on Twitter for real-time updates. Viki is proud to be a sponsor of CAAMFest, a celebration of Asian and Asian-American film, music, food, and culture. Music Matters, the premier pan-Asian music festival, has teamed up with CAAM and Viki to bring musicians like No Brain, SG Wannabe's Kim Jin Ho, and The Chairman to the United States for SF Music Matters Asia. Last night, we invited Kim Jin Ho to the Viki office, where he serenaded fans for our live Google+ Hangout. SF Music Matters Asia will start tonight at 7:00PM at Broadway Studios (435 Broadway), and tickets are available here. You can learn more about the concert by checking out the Facebook event page here. We are happy to announce that three popular Filipino dramas (also known as teleseyre)are coming to Viki! Only You is the 2009 Filipino remake of the Korean drama of the same title. Headstrong Jullian leaves her family and sets off for South Korea to pursue her dream of becoming a chef. This task is harder than she expected, so in a desperate attempt to succeed, she goes in search of a woman who can teach her a winning recipe. On her way, she meets and has a one-night stand with TJ, an arrogant wealthy businessman, who just happens to be the son of the woman Jullian is looking for. Will she get in touch with TJ again? This title is coming soon to viewers worldwide. Follow the Only You channel for updates! Stand for Love (also known as Gulang ng Palad) is the 2006 Filipino soap opera starring Kristine Hermosa and TJ Trinidad. Childhood friends Carding and Luisa are from two different social classes. After they are separated and reunited ten years later, their childhood friendship turns into love, but their relationship faces many challenges including interference from Carding’s mother and Mimi, the daughter-in-law she would prefer. With all the betrayal and misunderstandings that follow, will Carding and Luisa’s relationship survive? This title will be available to viewers worldwide. Stolen Moments (also known as Hiram) is the 2005 Filipino drama which tells the story of friendship and rivalry between a melancholy and self-sacrificing woman, Diana, who agreed to raise her friend's daughter Margaret before she passed away, and an ambitious and hateful woman, Sofia, who is enslaved by her past. Their rivalry continues in the next generation as best friends Margaret and Stephanie, Sophia's daughter, let a man come between them. This title will be available to viewers worldwide. Which of these shows are you most excited to watch? 03/11/13--14:59: Caption this "Playful Kiss" image for White Day! This Thursday is White Day! It's a cute tradition celebrated inJapan, South Korea, Taiwan, and China, a month after Valentine’s Day on March 14th, and is the day when men repay women for the gifts that they received on Valentine's Day. 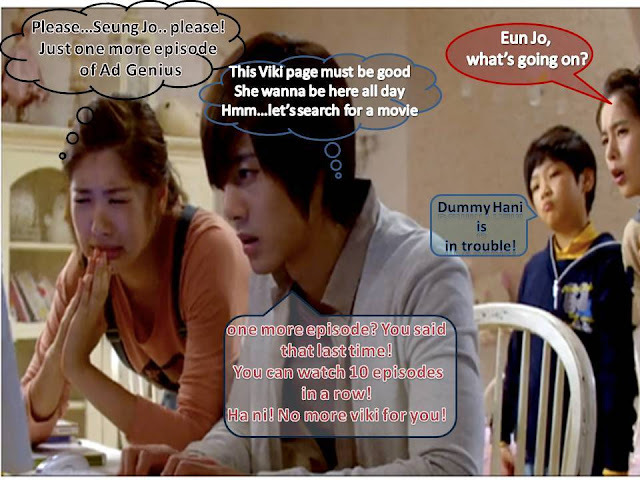 In celebration of White Day, we are having a "Playful Kiss" photo caption contest with some great prizes! Can you think of a clever caption for this photo? Caption this image from Playful Kiss for a chance to win some great prizes! For a chance to win a prize, you must enter the contest through our Facebook page. The top three captions will be chosen by fan vote, and will be announced on Friday, March 16th. You can submit an entry anytime from March 11 to March 13 PST. Fan voting on the submissions will begin on March 14 and end 24 hours later. 03/13/13--11:48: Are you ready for White Day? White Day is a cute tradition in Japan, South Korea, Taiwan, and China, where it's celebrated a month after Valentine’s Day, on March 14th. In Japan and South Koreait's tradition that women give chocolates to the men in their lives on Valentine's Day. In Japan, there are two types of chocolate gifts that women can give: giri choco (“obligation” chocolate) given to male co-workers, friends, or family members, and honmei choco(“true feeling” chocolate) given to one’s romantic, or potential, partner. On White Day, men reciprocate by giving candy,marshmallows or other gifts to the women who gave them chocolate on Valentine’s Day. Other typicalgifts given on White Day include stuffed animals, flowers, jewelry, and “white” gifts such as marshmallows, white chocolate, orwhite lingerie. In accordance tothe Japanese rule of sanbai gaeshi (“triple the return”), the gift given by men shouldbetriple the value of the original Valentine's Day gift! In Korean dramas, one very memorable White Day scene comes from “Iris.”Whileout on a date at a restaurant in Japan, Seung Hee (Kim Tae Hee) is disappointed to find out that Hyun Joon (Lee Byung Hun) doesn’t have a gift for her. Hyun Joon responds by running out of the restaurant, and when he returns, he surprises her by sharing the candy that is in his mouth with her through a kiss! Watch the scene here! Today, we are very excited to introduce a new part of the Viki experience. Viki TV is a video series covering events and trends around the world, taking you to the best hot spots of the global entertainment scene. With Viki TV, we'll bring you closer to your favorite stars and shows, with behind the scenes footage of local events and one on one interviews. But that's not all: anyone who remembers our Google+ Hangout with K-Pop boy group, Lunafly, can look forward to many more online fan meetings with entertainers overseas. Viki TV episodes will range from interviews with musicians and fashion designers to fun chat sessions about the latest in K-Drama, Anime, Bollywood, and more. Just subscribe to the Viki YouTube Channel and check out the Viki TV Playlist to find out more and keep up with the latest episodes. We'll be bringing you more exciting interviews and behind-the-scenes footage of CAAMFest through the rest of the month, and can't wait to show you everything else the Viki TV crew has been working on. 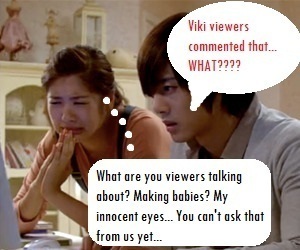 Watch Viki TV today! 03/15/13--13:44: Get ready for Lee Min Ho's album and concert tour! Have you ever wished you could see Lee Min Ho in person, or that he would sing to you from across the room?Start saving for your tickets because your wish could come true! Lee Min Ho's management agency just announced that he will be releasing his first music album worldwide and kicking off a concert tour in May. The Korean Wave star, who rose to fame through his lead role as Gu Jun Pyo in the 2009 Korean drama Boys Over Flowers, has sung at fan meetings in the past, but never released any songs officially until now. The actor will begin his 10-city concert tour in Korea and continue to Japan, Taiwan, Thailand, the Philippines, and other countries from May to July. The agency also said that Lee Min Ho has received a lot of love from fans in South America, Europe, and the Middle East, so who knows what other concert locations might be announced! The actor explained his motivation for releasing this special album. "My goal is to become an outstanding actor, being a singer is beyond my abilities. This album is a small present to thank my fans." The album has been in the works for two years now, and is an answer to fans' numerous requests for the songs from his fan meetings to be put into an album. As if you needed another reason to be excited about a Lee Min Ho album, a portion of the proceeds from album sales will be donated to charity. Lee Min Ho has starred in some of the hottest Korean dramas of the past few years including Faith, City Hunter, Personal Taste, and smash hit Boys Over Flowers. Mixing work with pleasure isn't always the best idea. But these celebrity love stories prove that sometimes office romances can succeed! For them the long hours on set brought them more than fame and a paycheck - it also brought love. Filipina actress Marian Rivera met her current boyfriend, Dingdong Dantes, on the set of Dyesebel back in 2008. The clock is ticking for them to tie the knot! She says that when she knows he is tired and filming, she likes to surprise him by baking banana bread and bringing it to him on set. Marian Rivera met boyfriend Dingdong Dantes on set of "Dyesebel"
Queen In Hyun's Man stars, Ji Hyun Woo and Yoo In Na, are in a steady relationship. Fans sensedthe connection between the actors right from the start of the show, but no one expected actor Ji Hyun Woo toconfess,“I love Yoo In Na” at the fan-meeting for Queen In Hyun’s Man after filming ended. Even Yoo In Na was surprised! Shortly after the confession the two were spotted on a late night romantic date, and shortly after that, Yoo In Na confirmed their relationship. The most recent celebrity couple is Kim Tae Hee and Rain. Kim Tae Hee, the star of upcoming drama 'Jang Ok Jung, Live in Love' met her boyfriend Rain two months ago, after filming a commercial together. She's expressed how supportive he is of her new show and career. Long time celebrity couple Han Jae Suk and Park Sol Mi will be getting married on April 21 in Eastern Seoul. What a great-looking wedding it'll be! They met on set of the 2010 KBS drama, “Merchant Kim Man Deok.” Don't miss Han Jae Suk in “Oohlala Couple." When you watched these real life couples on screen could you sense the chemistry? 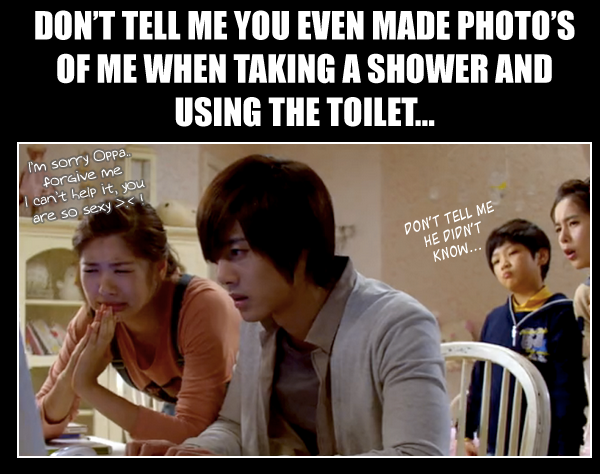 03/19/13--09:01: Announcing the Playful Kiss Photo Caption Winners! 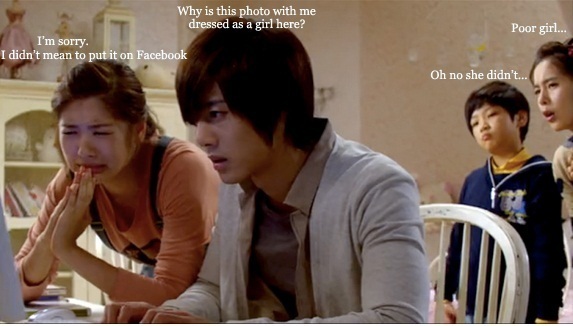 Last week, in celebration of White Day, we asked our readers to come up with a funny or clever caption for a scene from the K-Drama Playful Kiss. Thank you to everyone who submitted an entry - we received so many great ones! Fans have voted for their favorites and, without further ado, we give you the winners! For more news about upcoming games, keep checking our blog, Twitter, and Facebook! Hey, everyone. This is Nerses, the lead engineer on the video player project. Over the last several months, we've been working hard on updates to our video technology so that you can start watching videos faster, find and do things you want directly from the player itself, get bugs fixed quickly and much more. Timed Comments will appear on the left side, along with the commenter’s profile image; this will make it easier to distinguish one comment from another and show the conversations happening on any given scene. To turn Timed Comments on or off, click on "Timed Comments" above the comments. Changing the subtitle language will be easier through a drop down on the top right. Move your cursor over the two character symbols to change it. Sharing the video with friends will be easier directly from the video. Move your cursor over the “network” symbol to share via Facebook, Twitter and Google+, as well as find an embed link. This is where you can view the next episode in the series. Move your cursor over the "next" arrow and you’ll see a small preview icon. Even more updates to come, so stay tuned! In the meantime, we hope you love the new player as much as we do. Let us know what you think -send us a notethrough the Help Center or leave a comment here! These famous faces are most often recognized for their attractive good looks and acting talents. But they aren't just blessed with good looking genes, they're also smart! Their scholarly accomplishments, and educational pedigrees prove that you can have both brain and star power. This lovely lady is a member of the highly exclusive Mensa Society, certifying that her IQ qualifies her a genius. Her IQ is reportedly 156. She's is best known for her roles in K-Dramas like I Need Romance 2. She has beauty and brains. She attended the prestigious Seoul National University, and had perfect report cards in high school. She's is best known for her roles in K-Dramas like Iris, and My Princess, and will be in Jang Ok Jeong, Lives in Love, starting April 8. The Bollywood beauty and star of dozens of hit films such as Action Replayy, won the 1994 Miss World Pageant. She's been declared the most beautiful woman in the world by countless publications (and Oprah!) but this star doesn't rely on just her good looks. She attended the prestigious Ruparel College in India where she was an A student. She's also fluent in several languages including Hindi, Marathi, English and Tamil and her native language, Tulu. The 1930s film star was often cast as a seductress because of her stunningly good looks. But she was also a brilliant mathematician. Hedy's idea for a secret communications system led to a joint patent, with composer George Antheil, for an early version of spread spectrum communication technology -- a concept that served as the basis for modern technology such as Bluetooth, wireless telephones and Wi-Fi internet. Watch her in the classic Algiers where she meets a jewel thief in the mysterious Casbah. 03/25/13--17:06: Can You Believe These Stars Are the Same Age? Good genes, pricey beauty products, and lifestyle choices all factor into how young we look. But what keeps most celebrities looking so great? Is it the dedicated skincare regimen, featuring products like volcanic ash face scrub (burns off blackheads) and snail-essence moisturizer (slows down wrinkles)? Or is it a superior set of family genes (example: siblings Kim Tae Hee and Lee Wan)? We also can't forget the role of a certain kind of "doctor's visit" in keeping our favorite stars looking fresh. To get some perspective on this question, we've compared celebrities born in the same year. Moon Embracing the Sun actress Han Ga In is the same age as pregnant Duchess Kate Middleton. Reply 1997 's Eun Ji Won and Princess Stand In's James Wen both starred in hit dramas, and were also born in the same year. See the first episode of new Taiwanese drama Princess Stand In below and judge for yourself how good James Wen looks at 35. It's nearly impossible to believe that American pop culture icons, Lindsay Lohan and Carly Rae Jepsen are born in the same year! Are you surprised by the ages of these stars? Which celebrity do you think has the most youthful look? 03/26/13--13:06: Taiwanese Drama, Princess Stand In, Now Available! We have some exciting news for Taiwanese drama fans. Princess Stand In, a drama from Sanlih E-Television, one of the top television stations in Taiwan, is now available on Viki. And more are on the way! Princess Stand In (aka King Flower / Substitute Princess) Now On-Air! All her life Jin Da Hua (Nikki Hsieh) has not been pretty girl. But when her gambling father chalks up a huge debt of NT$2 million, she's given the chance to get the money and save her family. She meets Ou Yang Tai (Chris Wu) who recently lost his fiancé, and who sees a resemblance between Da Hua and his beloved. He offers to pay for her plastic surgery to make Da Hua look like his dead fiancé, if she helps him further his career by entering into a contract marriage with him. The first 11 episodes are available now, and the first episode is already available with English subtitles, thanks to our fantastic volunteer team! Watch episode 1 below, and follow the channel for updates. New episodes will be available every Monday. Other Taiwanese titles such as Love Now, Lady Maid Maid, Autumn’s Concerto, Inborn Pair, The Fierce Wife and more are coming soon, so stay tuned! All shows are available in the Americas, Europe, Africa, Middle East, Australia, Philippines, Indonesia and India. Select titles are also available in Thailand. Stay tuned here on our blog, Twitter, and Facebook for the latest news on all our upcoming Taiwanese shows! When we go through a break-up we can do so in the privacy of our homes -- in pajamas on the couch eating ice cream. But stars have it much harder as they have to deal with the ups-and-downs of their relationships in the public eye. These hot young couples have lived every moment of their relationship under a media microscope, including their break-ups. The popular Korean idol couple caused a stir amongst Korean entertainment fans when they began dating, just broke up after a two-year relationship. Hara's agency claimed that the pair grew apart since their busy schedules prevented them from spending time together, but stated that they want to remain good colleagues. Goo Hara made her Korean drama acting debut with "City Hunter." American pop-star couple Selena Gomez and Justin Bieber split up for the second time at the beginning of the year, after a heated argument while on vacation. Sources say that Justin was upset about Selena partying without him. Their decision to part ways was reportedly due to too much time apart, and Justin getting too close to Victoria's Secret model Barbara Palvin. Earlier this month, gossip blogs jumped on the chance to speculate about a breakup between Miley Cyrus and her fiancé Liam Hemsworth, after Liam flew to Australia and Miley was spotted without her extravagant engagement ring. Miley has denied break-up reports, but watch the below video to come to your own conclusion. 03/29/13--13:25: Get ready! Lee Min Ho to Return to TV! 2013 is going to be a busy year for Lee Min Ho. The star recently announced an upcoming album and tour in May, and today he confirmed he'll be making a return to acting this year in K-Drama tentatively titled "The One Trying to Wear the Crown, Withstand the Weight - The Heirs." The Heirs will be written by Kim Eun Sook, writer of Secret Garden and A Gentleman's Dignity. The new show's script and character will be tailor made for Lee Min Ho. Producers are currently auditioning actresses for the role of leading lady. Who would you like to see cast beside him? 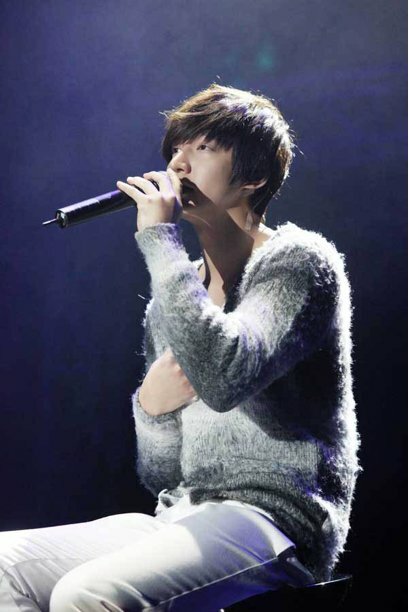 Until the show airs, fans can look forward to Lee Min Ho's upcoming album and tour in May. See more about his album and tour below!